CCM Series Hydraulic Cone Crusher is new series quarry equipment with high performance,which absorbs the advanced technology in the world.The biggest advantages of SMS series hydraulic cone crusher is to make each part of the force more reasonable,more efficient power conversion, be able to use a larger eccentricity and higher speeds, resulting in higher yields.It is suitable to crush hard and mid-hard ores and rocks.CCM series hydraulic cone crusher discharge opening is adjusted by hydraulic motor driven adjustment sets to achieve, with the adjustment of the hydraulic locking cylinder lock sets, so you do not arrive at the scene to complete the work of the nesting population adjustment.The integration of newly designed chassis, including the master device, motor, belt guard and other installed modules, simplifying the installation procedure, in order to bring great convenience. CCM series fully hydraulic cone crusher is consist of main frame, drive shaft, eccentric, socket liner, crushing body, adjusting device, adjusting sleeve, lubrication system and hydraulic system. 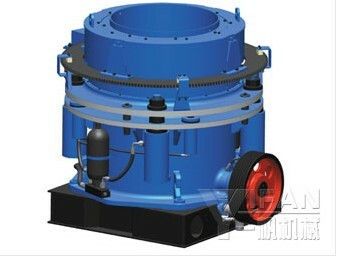 When the crusher working, the motor drives the eccentric rotating through the drive shaft and a pair of bevel gear, cone axis does rotary pendulum movement under the force of eccentric sleeve , which makes the mantle surface sometimes near the concave, sometimes far from the concave, so that the ore in the crushing cavity is continually squeezed and being broken. The material enter into the crusher from the upper feed opening, by crushing can be discharged from the bottom discharge opening.